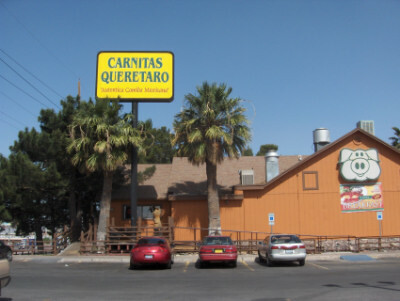 Carnitas Querétaro has multiple locations in El Paso, and each one is packed with extended families and groups of friends who come for “Mexican comfort food” that is filling and served as it would be found in a typical restaurant in Mexico. The emphasis at CQ is on meat– there are probably more types of Mexican meat dishes served here than at any other restaurant in El Paso, including lamb barbacoa, buche, and other specialties not usually found in the more Americanized Mexican restaurants. Most of the meat items served are familiar to people, such as steaks, tacos, and burritos. It is definitely not necessary to “take a chance” on something new if you already have a favorite dish you would like to try. The more adventurous dishes here have not been my favorites, but I suppose they may be to many people. The Lamb Barbacoa had a more “gamey” taste at Carnitas Querétaro than I remembered from eating it in Austin many years ago, but this may be the way it is supposed to be. I am probably not a very good judge of such things. If the restaurant has a specialty it is the carnitas, and I think the ones here are some of the best you can find. I have found that there is a wide range of quality in this dish between the best restaurants (such as this one) and those who seem to have not quite mastered the method of preparing them. 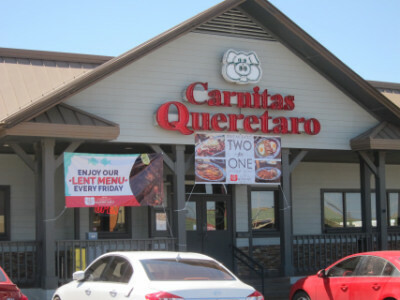 I do not think Carnitas Querétaro is particularly known for its more generic Mexican food that is served at just about every restaurant (enchiladas, chiles rellenos, etc.). There are some exceptions, though, which I will point out in the write-up. I would also pretty much forget about finding any exceptional vegetarian food here, since almost all the standout items I have tried have been meat items. The exception would probably be some of the vegetarian enchiladas including the standard red or green (probably green is better), mole, or the spicier sauces such as chipotle (they might have some other sauces available as well). I have found that they will try to honor custom orders for enchiladas or other dishes if they can. 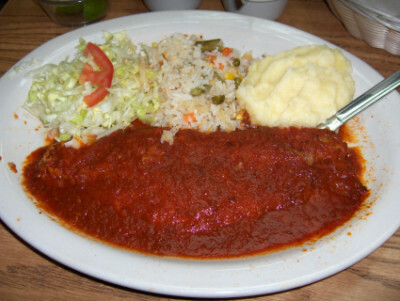 Chicken Mole was once considered a rather exotic dish in El Paso, but is now found in most restaurants. Few do it as well, though, as Carnitas Querétaro. 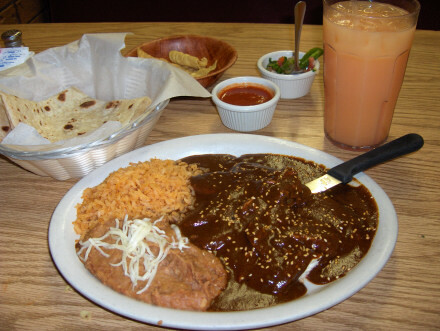 The mole has a more subtle flavor than at other places, and I would judge it to be one of the premier representations of this dish in El Paso. Although some first time eaters are apprehensive about the dish because one of its base ingredients is chocolate, the mole at Carnitas Querétaro is made from such a rich mixture of flavors the chocolate is not as readily discernible as in other versions. The Chicken Mole Dinner is served with grilled chicken breast meat, in CQ’s apparent attempt to serve a more upscale version of this entrée than is being done at restaurants that use shredded chicken. Although I like the flavor of the dish it is a lot of food for my appetite (as are many dishes at this restaurant). I think the mole dinner always goes better with a flour tortilla (they provide a corn tortilla unless you ask for the flour one). Certain drinks seem to go best as well, with my preference being the cantaloupe drink (melón). The Mole Burrito is made with shredded chicken for the more traditional style of mole. The burrito is wrapped in the same flour tortilla that comes on the side with the dinner, and might be a preferred alternative to the larger dinner portion. It has all the flavors of the mole dinner, but in a different form (I give the disclaimer, though, that I had this at the old restaurant before it moved to Remcon and I am not sure if they still do it the same way). Enmoladas are another form of a mole dinner, and are popular with those who want the mole flavor but without a lot of meat. 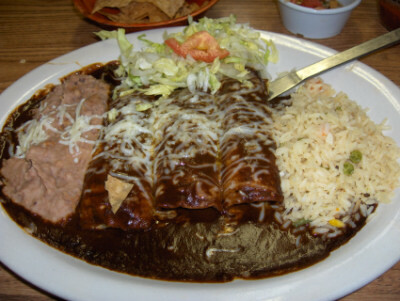 “Enchiladas” are tortillas with chile and “Enmoladas” substitute mole for the chile as the topping. The menu offers either cheese or chicken inside, but personally I think if I want chicken the mole burritos are probably better. The enmoladas with cheese offer a good opportunity for a delicious non-meat meal (although some would argue the cheese does not really make this vegetarian). 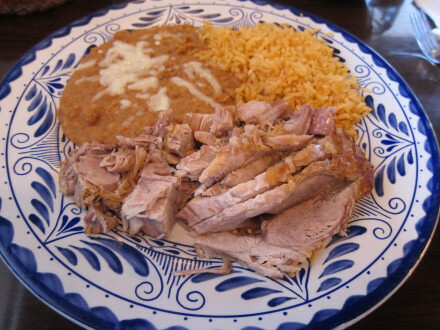 Carnitas (pork) is the signature dish of this restaurant, with the recipe originating in Querétaro (the rest of the menu is Chihuahua style). I was able to sample this at the new restaurant and found it to have an excellent flavor (perhaps the best of their meat dishes). There is a large quantity of meat on the plate, but if you are going to do this I think Carnitas Querétaro probably has the best flavor I have found. Carnitas tacos are also available for a smaller portion of meat. Enchiladas suizas at the old restaurant on Mesa St.
Green Enchiladas have been one of my favorite items since I used to eat at the old restaurant on Mesa Street, and are even better when turned into Enchiladas Suizas (served with white meat chicken inside and sour cream on top). The green chile seems to be a rather spicy Mexican variety, and is similar to the type I have eaten in Sanborn’s and other restaurants in Mexico. Being made with tomatillos, though, it has a more sour flavor than the New Mexico green chile or the local green chile normally served in El Paso, and is not quite as spicy. The enchiladas suizas I ordered at the new restaurant on Remcon had a somewhat different appearance than before (as shown in the photo above). They have mixed crema with the chile in addition to sprinkling it on the top. I thought the new version had a better flavor. The rice and beans are now served in side dishes while previously they were served on the plate (so the overall quantity of food is the same but it is presented differently). I have not ordered Red Enchiladas at the new restaurant, but previously I found them to be less flavorful than the green. 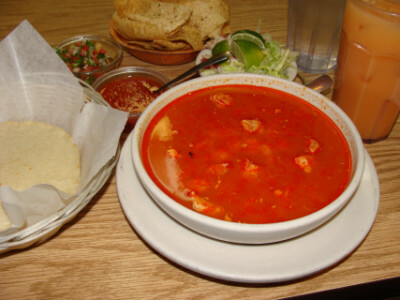 Some Photos and Reports from the Old Restaurant on Mesa St.
Pozole Tapatio, or hominy served with pork chunks and red chile, is one of the most flavorful versions of the dish I have tried. The yellow hominy might be an acquired taste for some, but mixed with the red chile and meat it offers another great opportunity to venture out from the mundane menu found at most restaurants. Several soups are on the menu but so far this is one of the best I have found. The pozole comes with tortillas on the side, limes for flavoring, and cabbage to put into the soup if you desire. With all the side dishes that are served, I find the large bowl to be enough for a meal. I also think it is a big reason I enjoy the pozole here so much. 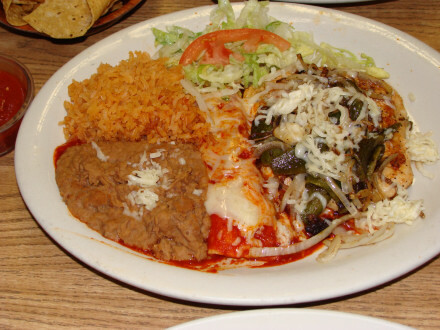 The Chile Relleno has a flavorful chile that is very hot because of leaving the seeds inside, a good cheese, and a ranchero sauce that covers it with large chunks of tomato and chiles (chiles on top of another chile!). It may be a little more greasy than other versions though. Flautas have the same high quality as most of the other dishes, with the customary guacamole and sour cream (or at least this is customary in the more authentic Mexican restaurants). The chicken version comes with meat that is tender and flavorful. 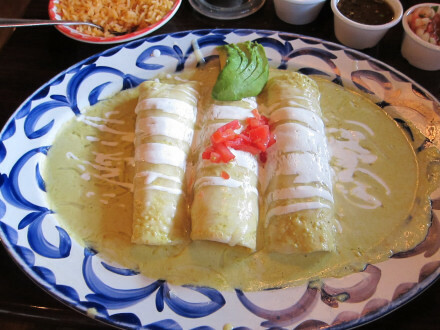 The guacamole that covers the flauta is puréed, but customers can also request the more chunky variety on the side as in the photo. 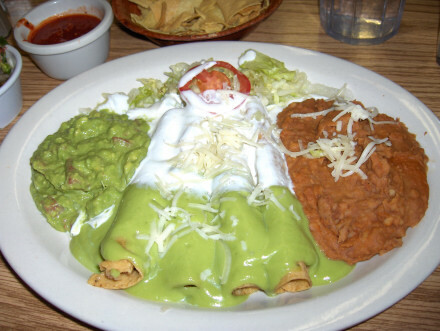 Chicken Tampiqueña in El Paso restaurants refers to grilled chicken with green chiles on top, accompanied by a red enchilada (and usually rice and beans). Restaurants usually give a price break ordering it this way as opposed to ordering chicken and an enchilada separately, so I usually find this dish to be a good choice. This photo is from the old restaurant but I imagine the plate is still much the same. Rice, Beans, Chips, Salsa, etc. The Chips are thick and I find them to be very good (although some others in El Paso are better). Sometimes they are overly salty but not always. Salsas are excellent, and you get both a red salsa and a dark colored one with the chips. I know the Rice and Beans are good, but I have not made an attempt to compare them to other restaurants. You can usually get free Tortillas with the meal. The corn tortillas are freshly made and cooked in the restaurant (I do not know about the flour tortillas but I remember them being fresh as well). One of the best features of Carnitas Querétaro is the variety of Aguas Frescas that are served. While many restaurants in El Paso can compete for the best food, serving these authentic Mexican drinks plays a large part in the overall experience, and surprisingly few restaurants do it as well as Carnitas Querétaro. Horchata is the traditional drink with lent specials (at least it is traditional with me), and the one here has a good cinnamon flavor. Melón (canteloupe) is usually my favorite of the aguas frescas, and while it has traditionally been available only during the harvest season in the Pecos Valley or in California, I believe the availability of the fruit now lasts a large part of the year. The Lemonade at CQ rivals the other drinks for quality and enjoyment. The aguas frescas are almost like a wine in that patrons can pair their meals with the proper drink just as they would at a fine dining restaurant. Personally I get just about as much enjoyment out of the drinks at Carnitas Querétaro as I would with a fine wine. Iced tea is also excellent. On Fridays during Lent Carnitas Querétaro serves Comida de Cuaresma (Lent Dinner) specials that are among my favorite Mexican food experiences. Lent specials are provided for the faithful who wish to go without meat at least one day a week in favor of a fish or vegetarian meal. The restaurant says on the menu “It’s time to be good,” but I think it is also time to enjoy some delicious meals. 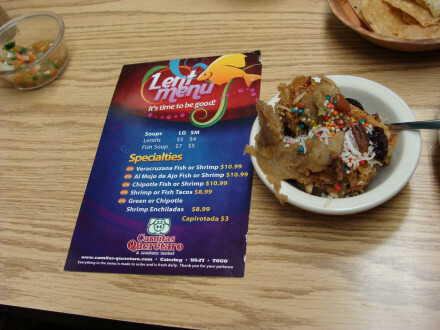 The Lent menu has changed over the years, and it now offers fewer choices than before. The full dinner is very good, and comes with either fish or shrimp and a choice of sauces (veracruzano, chipotle, diabla, and mojo de ajo). Dinners come with soup and capirotada for dessert, and the side dishes on the plate are mashed potatoes, rice, salad, and bread. Also available are some lighter plates including fish tacos (but these do not come with the soup and dessert). 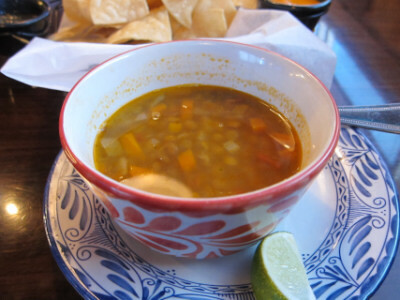 I particularly like the Lentejas, or lentil soup that comes with the full dinner special. This soup is wonderful in its simplicity, with whole lentils, a few spices, and a dark broth. Served with Horchata, a rice drink with cinnamon, this is the start to a classic El Paso style Lent meal. Corn or flour tortillas are available on request with the meal, but I like the tortilla better with the soup (I think corn goes best with it). I was surprised to discover that fish dinners are only available at Carnitas Querétaro during Lent, and shrimp choices are more limited on the regular menu (they do have fish enchiladas, shrimp enchiladas, shrimp tacos, and several mahi mahi dishes on the regular menu). For me it is definitely worthwhile to get the fish plates on the Lent special while they are available. 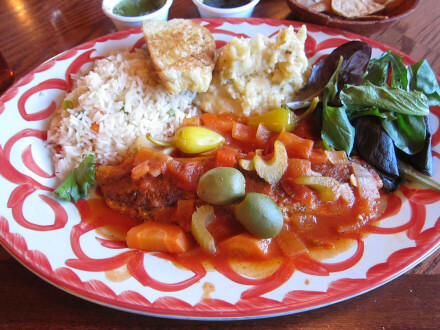 One of the styles served is Pescado Veracruzano, or Veracruz style fish with a tomato sauce and green olives. The flavor of the fish is mild, and this helps to highlight the delicious sauce with green olives, chiles, and spices. I probably enjoy the Mashed Potatoes as much as anything on the plate, with a home made (not from instant potatoes) taste. The sauce is slightly spicy and is made with guero chile (which is not considered to be one of the hottest varieties). The Diabla Style Fish Fillet of course is known for being extremely spicy food, and I believe it is on the current menu (this photo, though, is from the old restaurant). Order the Al Mojo de Ajo fish or shrimp if you like an overwhelming garlic flavor (this is also something I tried at the old restaurant). 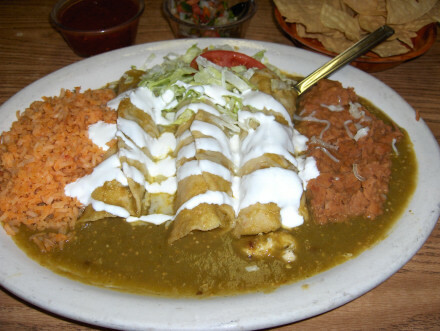 It is also possible to order a vegetarian meal, and of course enchiladas are always available from the menu. The old restaurant had a special sauce available on the Lent menu on the Green Chipotle Enchiladas (shrimp chipotle enchiladas were also available). This may still available as a special order, but is not on the current menu (creamy chipotle enchiladas are available on the regular menu, and the sauce is one of the choices for the Lent specials). Capirotada dessert tops it off, a kind of drunken bread pudding with raisins and the little sugar balls on top that are sometimes used on cupcakes. There are several Lent specials I enjoy in El Paso, but the one at Carnitas Querétaro is one of the best in terms of food quality (good fish, soup, and dessert). It is also one of the most filling and most expensive, which to me is probably its biggest drawback. Because this is a special menu only done once a year, though, I have found that it pays to go to restaurants with a long history of doing it, such as Carnitas Querétaro. The quality and flavor here are good, and it is worth the money if you have a good appetite. 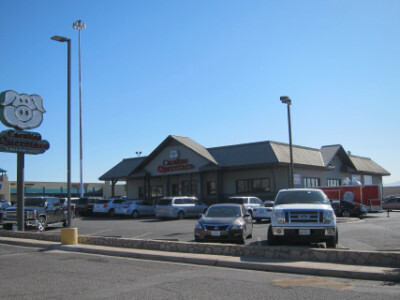 Carnitas Querétaro currently has four locations in El Paso, but I would advise checking on line because the locations change from time to time. The former restaurant at 6516 N. Mesa St. is where many photos in this review were taken, but it has now moved a few blocks west to 7410 Remcon Circle (at the corner of Mesa and Remcon). I have also been to the restaurant on Interstate 10 (9077 Gateway West), which has the same menu as the west side location. There are now two other east side restaurants at 1451 N. Zaragoza Rd. and 12706 Montana. Carnitas Querétaro has been a pleasant surprise in the way they have changed some of the dishes from the style served at the old restaurant on Mesa (enchiladas suizas are an example of dishes I think have improved). The carnitas also tasted better than the ones I tried at the old restaurant, but I have not eaten them enough to say that this is a trend rather than just my own somewhat random experiences. Prices have risen quite a bit from the days of the “old” restaurant, and I have particurly noticed this on the Lent specials. So far, though, I have mostly thought the higher prices are a good tradeoff for the very comfortable dining room they now have and the upgrades they have made to some of the dishes. Although, not exactly comparable, but, have you been to Anson11? It’s one of the restaurants that are part of the revitalization in Downtown El Paso. It’s pretty nice. I would like to hear your opinion on it. Yes, this is a very interesting suggestion. An El Paso Times article pointed out that Paul Foster teamed up with Carlos Murguia (owner of Barrigas) to open Anson 11 in downtown El Paso. The concept was to have a more casual downstairs restaurant and an upscale restaurant on the second floor with a different menu. I don’t have any personal comments about the food because I haven’t been there, but I have full confidence in it, knowing that it is part of the Barrigas group. You may be able to let me know if this is correct or not, but it sounds as if it would be comparable to Cafe Central (another upscale restaurant downtown). I have not made upscale restaurants a focus of this blog, but the puntas de filete at Cafe Central are really of interest to me as being upscale Mexican food–a type of cuisine that Rick Bayless often discusses on his program and which I sometimes like to include in my food experiences (despite the higher cost that I incur). I am pleased by the downtown revitalization which is occurring, and the reviews indicate that Anson 11 is a restaurant that will not disappoint. It looks as if you are writing on behalf of Anson 11, and of course I welcome any comments such as this. When going to Anson 11 my main question would be what to expect from the two menus (assuming it is correct that there are two menus). Is the downstairs comparable to Barrigas and upstairs is more upscale, or are both different by not focusing as much on Mexican food? In any case I’ll put it on my wish list to try when I am back in El Paso. In keeping the focus of this discussion on Carnitas Queretaro I will say that I think both C.Q. 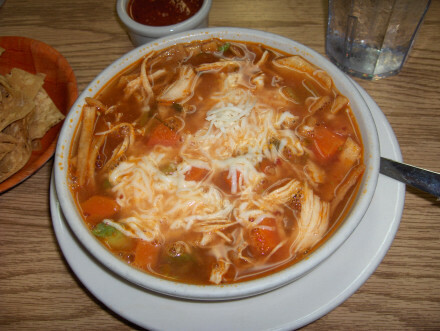 and Barrigas offer very good choices for El Paso and Chihuahua style Mexican food, although for different items. Carnitas Queretaro has moved since the last time I ate there, but at the time the setting was more downscale than Barrigas although the quality of the food was comparable. I have been moving my reviews from the older web site to this blog so readers can make comments, and I will try to add Barrigas to the blog very soon.